Funeral service in Christ Church Limavady on Monday at 1pm followed by interment in adjoining churchyard. 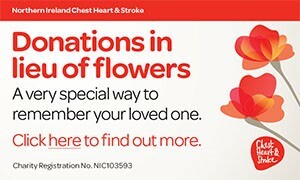 Family flowers only please, donations if desired to a charity of the family's choice, c/o Browns, Funeral Directors, 25 Church Street, Limavady. Will be lovingly remembered and sadly missed by her entire family circle. I am sorry to tell you that Stella Bell has passed away.